sometimes, you find yourself in heaven a used bookstore and you find the most marvelous and unexpected thing. something you didn't even know existed, but when you saw it and paged through it, it made your molecules hum in perfect alignment and you knew that you had to have it. 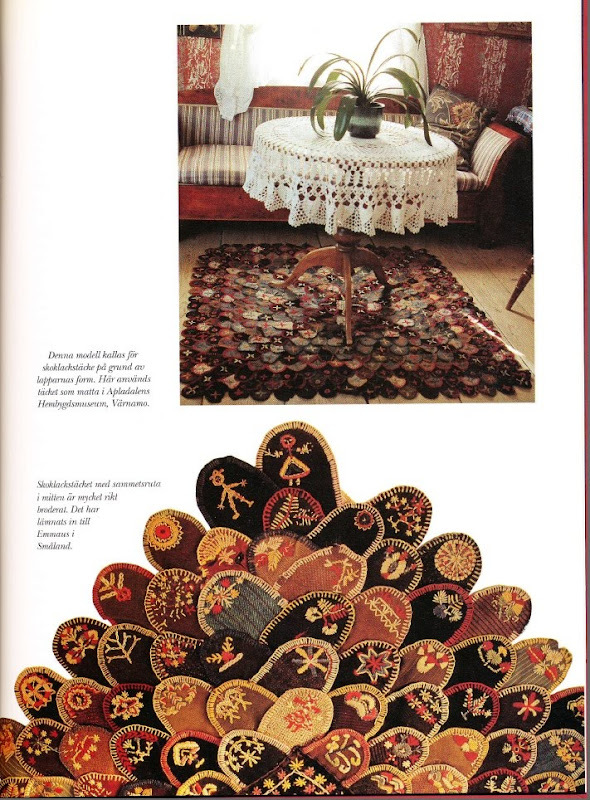 and you thanked your lucky stars that someone saw fit to sell off a woman named birgitta schøning's fabulous collection of embroidery and quilting books. and you wish, just for a moment, that you had had the chance to know her or at the very least to see what she made with the inspiration she found. and you wonder if the inspiration you'll find there will echo hers or continue hers or somehow carry along the line that extends clear into the book. and you sigh. and you are happy. and oddly you realize you have no problem reading swedish. i wondered aloud once whether memory can be preserved in cloth. and now i believe it can. 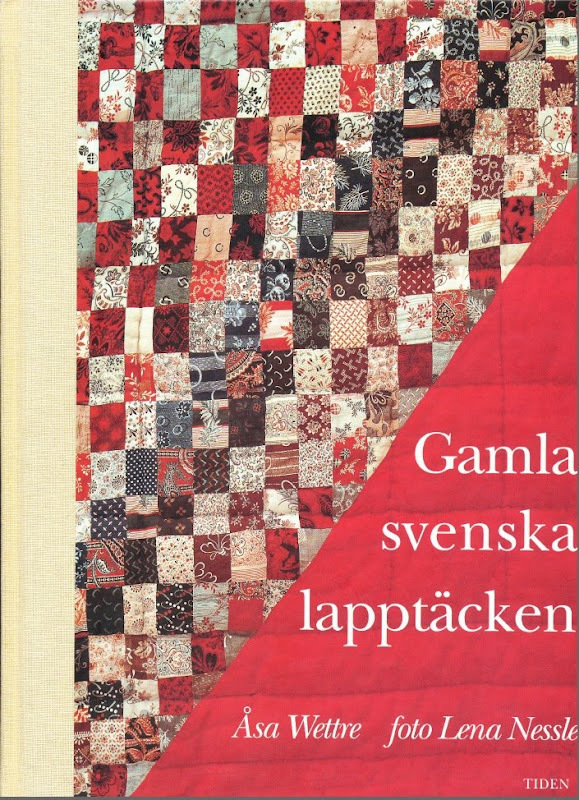 and the quilts in this book. so much inspiration. which i'll save for another day. sometimes you find a treasure when you least expect it. and when you most need it. I would like to see more of what the Japanese do regarding their best artisans. Those still living become "Living National Treasures". And if a living Japanese artisan becomes significant they will sometimes take the name of a master who practiced the same trade generations before. 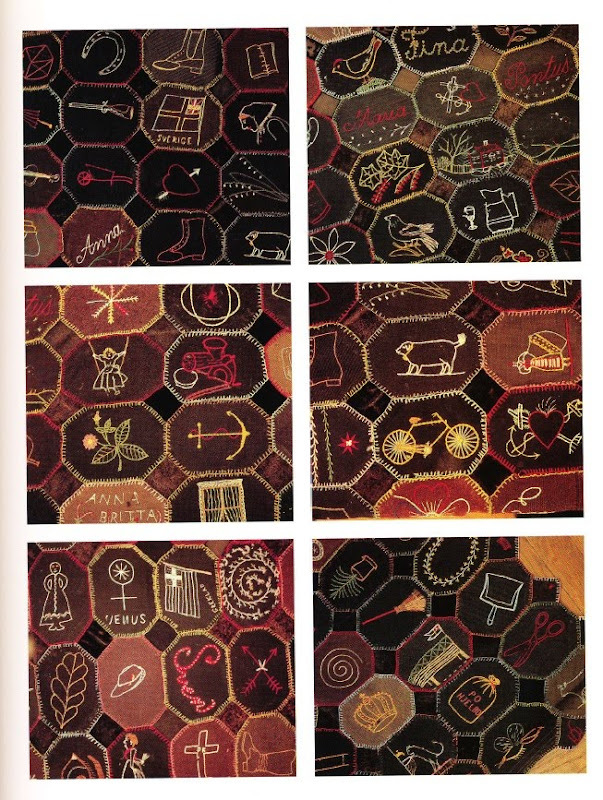 Honoring arts and crafts is something we've gotten away from as pop entertainment now fills everyday consciousness. Wait... This means you can read my book too! Did you see that I made my debut as a poet last month at a poetry festival and published my first book? Illustrated poetry. Yay! I'm going to translate it (Swedish - English) as well but haven't had the time yet. Had to come by and just see/drool one more time. 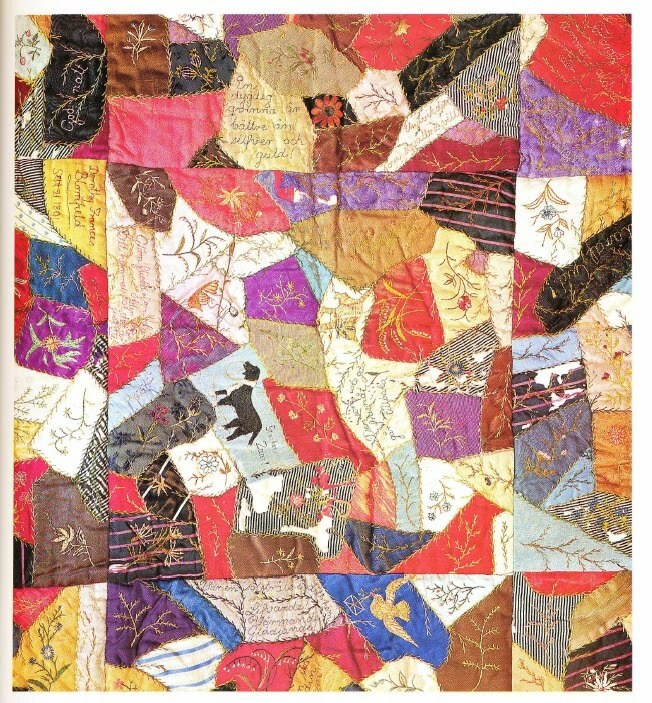 I just love patchwork. There's something to learn on my wish list. Well chosen post. 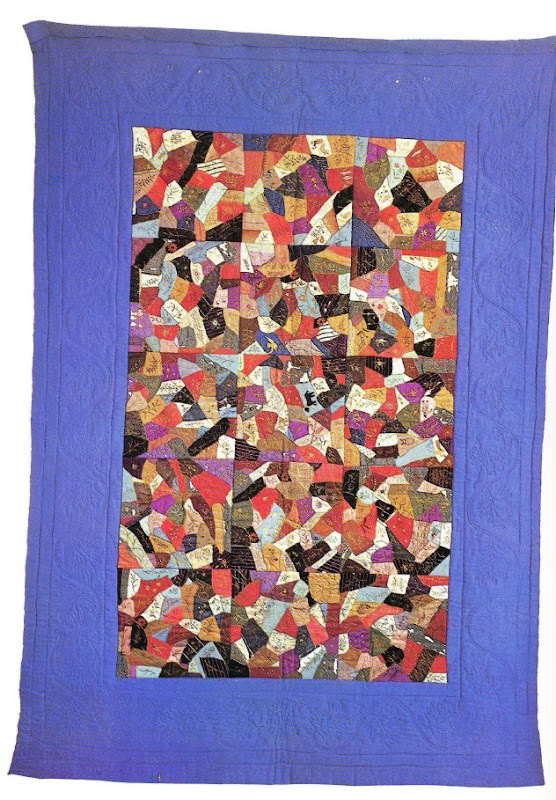 Not what I would picture when I hear the word quilt...these are truly works of art! Absolutely stunning!! My soul. These are amazing. Oh my GAAAHD I want it. WANT. those are so beautiful that i'm on the verge of weepy. i love that kind of stuff. this is such a keepsakes treasure. i want to own one! 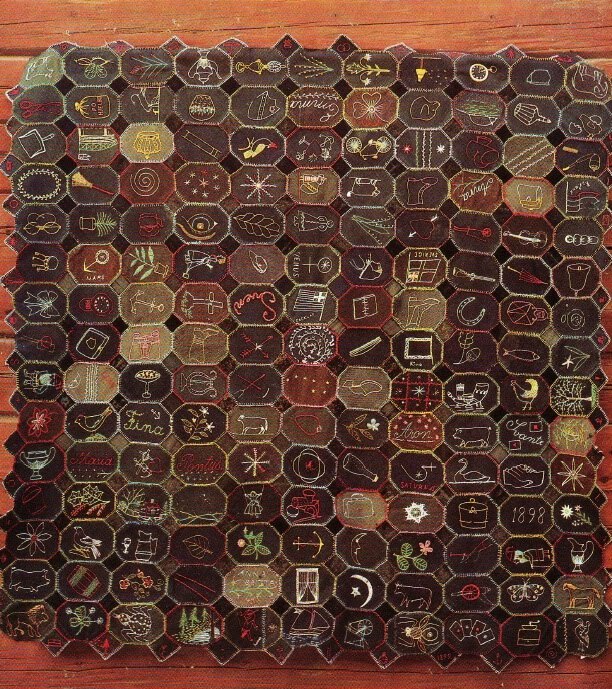 The brown quilt with a different embroidery in every single octagon is impressive as heck! My goodness!